Polaroid OneStep “Classic White” Rainbow SX-70 in original box! This Vintage Polaroid is in great working condition and in good cosmetic condition with some scuffs and scratches on the black plastic body from normal use. The lens looks good, the motor sounds great, the output unit runs smoothly, and the pressure rollers spin freely. The original neck strap is well attached and everything opens and closes easily. Please see the photos for more information on the condition. Camera in pictures is the actual camera you will get. This camera has two silver rollers and will not have the jamming problem that the gold and silver roller combo have (explanation below). The original box is not in the best shape but still really nice. It has some rips along the top and along the inside seam. 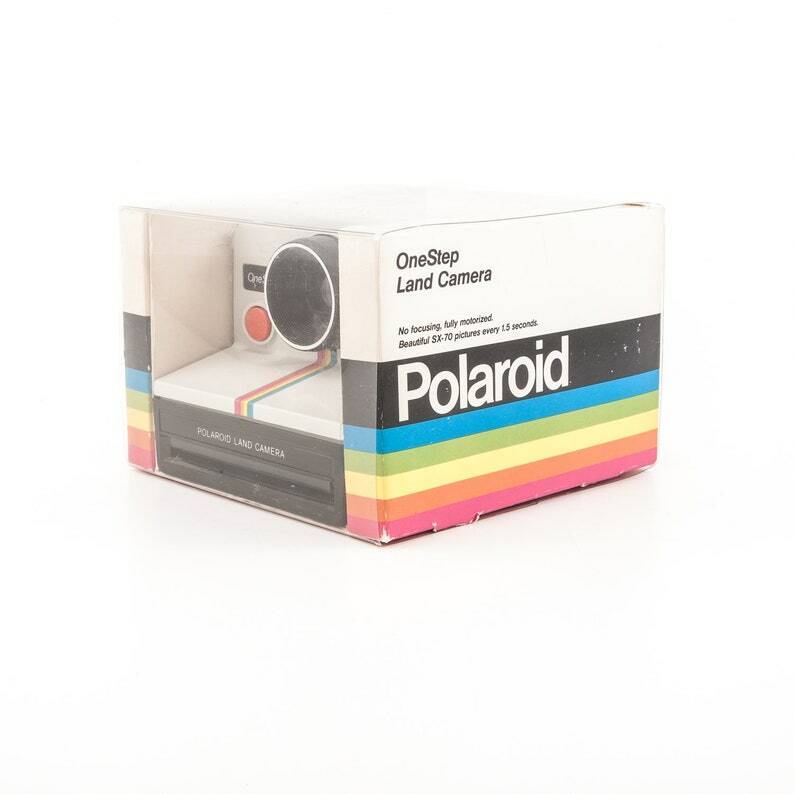 This is the famous white with rainbow stripe camera with a “fixed focus” plastic lens (also known as the Polaroid 1000 camera in the UK). Please note that this camera has been tested and is working properly. All of our cameras have been pre-owned and therefore may have some cosmetic imperfections scuﬀs or marks. Any imperfections will not get in the way of making great, great images! Due to a number of factors outside of my control, I cannot guarantee your results with the included film pack. My apologies.